Creates a Staff Template and 3 Staff Member records. Go to: Staff List > Admin > Quick Start tab. Select Template Layout (Pro only). Preview the Staff Template created in Step 1. Go to: Staff List > Staff Templates. Get familiar with Template Options. Check Input Fields section. There should be 6 fields created. 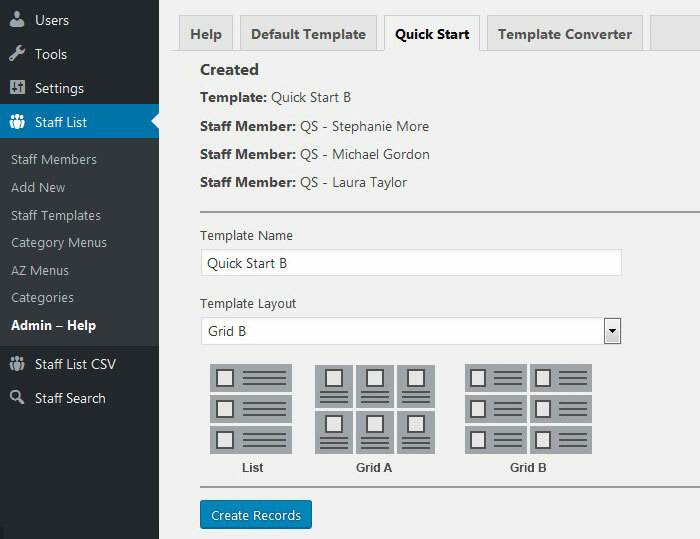 Preview the Staff Member records created in Step 1. There should be 3 staff member records. Staff member records will contain sample data. Open each record and check field names and data. Create a page to display Staff List. Open the quick start template. Copy the Staff Page shortcode. Paste the shortcode into a content editor. Open the newly created page. Quick start example (List layout). How to create and publish a single page: Step by Step.